On May 23rd and 24th I had the opportunity to witness true athleticism at the CrossFit East Regional in Hartford. “What is CrossFit?” you may be asking CrossFit is a fitness program that consists of constantly varied, high-intensity, functional movement. It takes movements we use every day and cranks it up a notch. The beauty of CrossFit is that it is scalable to every individual’s fitness level. I was introduced to CrossFit on a whim, and I’ve been hooked ever since. Cut to two and a half years later and I still have the same joy and passion for it. This passion has led me to want to help others along their fitness journey and become a CrossFit Level 1 Trainer and inspire them to lead healthier lives. 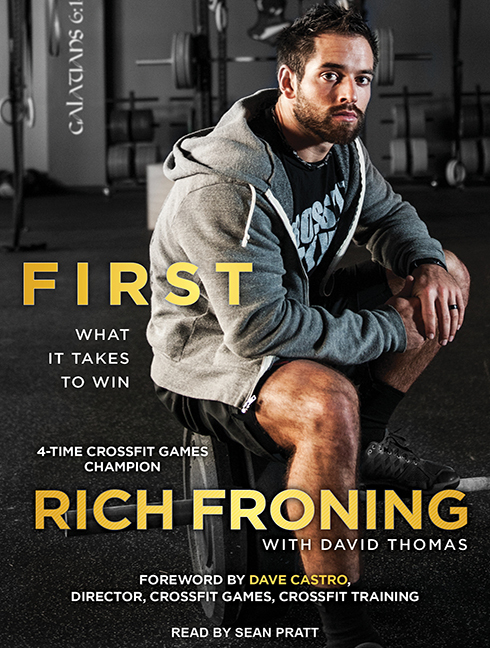 The breakout star of CrossFit and a name that is constantly on everyone’s lips in the community is four-time Games champion, “Fittest Man on Earth,” and author Rich Froning (First: What It Takes to Win, with David Thomas). Rich competed as an individual for four years at the Games, but in 2014 he “retired” to join the Teams division. He and his team, CrossFit Mayhem Freedom, competed in the Central Regional this past weekend. You can watch archived footage of the event here and be sure to check out Froning’s book, narrated by Sean Pratt! The winners of the 2015 Men’s East Regional: Spencer Hendel, Alex Vigneault, Mathew Fraser, Daniel Tyminski, and Austin Malleolo. Winners of the 2015 Women’s East Regional: Carol-Ann Reason-Thibault, Dani Horan, Michele Letendre, Kari Pearce, and Kelley Jackson.